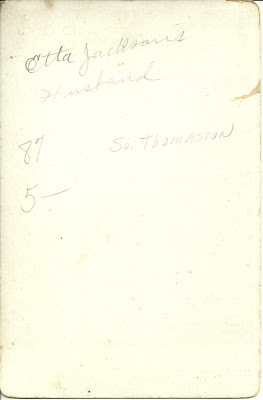 A Maine woman has graciously forwarded this image of the handwritten record of the family of Theophilus and Sarah (Rockwood) Hamlin of Augusta, Maine. I was able to find this family by researching online, though there were a few discrepancies in dates. The dates on this record may be the correct ones in all instances, or the person recording the entries on this record may have been recalling at a distance in time and may have made a mistake or two. Theophilus Hamlin was born 6 December 1765 and died 5 Apr 1842. His wife Sarah (Rockwood) Hamlin was born 25 August 1764 and died 6 December 1826. Sarah, born 31 March 1789; married Joseph Ladd of Augusta, Maine; their son Daniel Ladd emigrated to Florida, where he became a very wealthy merchant. Malvina, born 27 September 1807; married William L. Wheeler of Augusta, Maine. Henry Weld Severance, born 12 July 1828; married Hannah Swann Child; "Now Lives in Honolulu, S.I." Anna Severance, born 12 April 1831; married William Cooper Parke; "Now Lives in Honolulu, S.I." 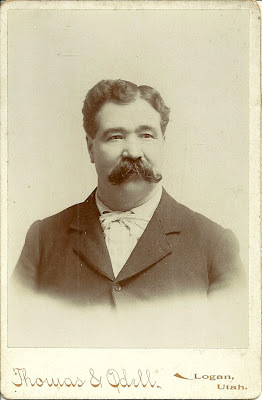 Luther Severance, born 1 June 1836; "Now Lives in Honolulu, S.I." Luther Severance was United States Commissioner to the Sandwich Islands from 1850 to 1854. Taking into account the phrase: "Now Lives in Honolulu, S.I. ", it is possible that this record was completed before 1854, unless the family stayed in the Sandwich Islands after Luther's Commission expired. From online research, I found that the parents of Theophilus Hamlin were Nathaniel and Sarah (Baker) Hamlin from Connecticut and Massachusetts; they married in Massachusetts and later moved to Maine. Sarah Rockwood was the daughter of John Rockwood of Massachusetts and his wife Hannah (Frost) Rockwood. I believe that John died in Massachusetts but his widow Hannah died in Maine; whether she came to Maine after he died, or if he also had moved to Maine but then happened to die in Massachusetts - I don't know. This has been a fascinating family to research. If you have any corrections, comments or insights on any of the people discussed above, please pass them along. Photographs of Unidentified Families Who Emigrated to Canada - Do You Recognize Anyone? 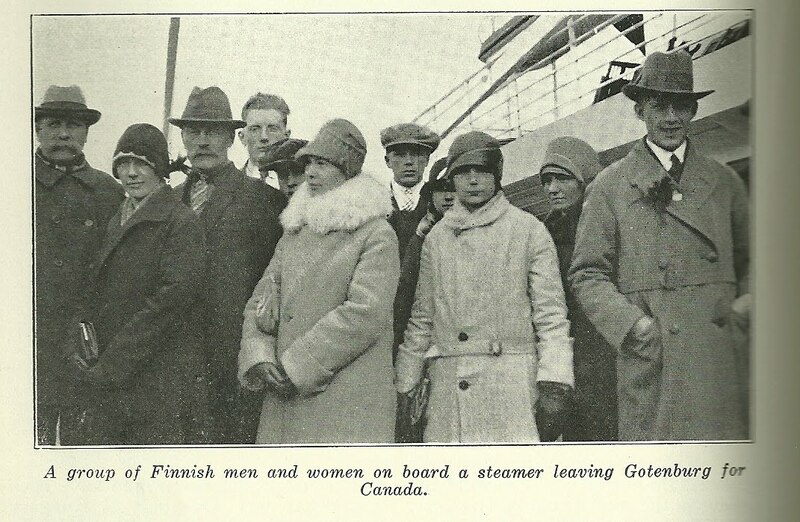 While going through some old issues of the Canadian Geographical Journal, I found these photographs in an article about the non-British component of European immigrants to Canada, in the March, 1931 issue. It would be a blast if you were to recognize one of the families shown below. If so, please contact me! 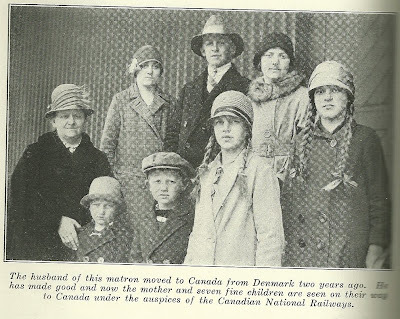 A Danish man and his wife and four children, who had just passed the Canadian National Railway's Officer. The people were going to the Maritime Provinces to settle. The husband of this matron moved to Canada from Denmark two years ago. 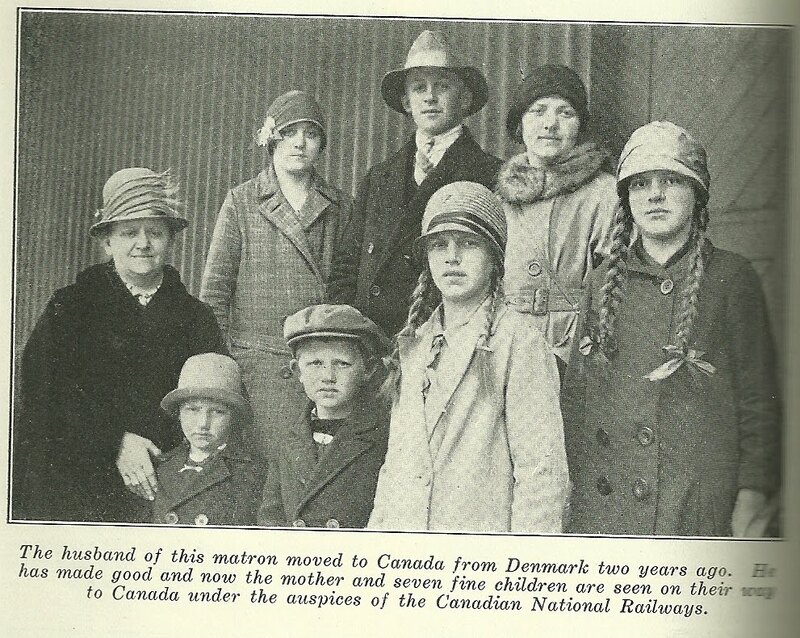 He has made good and now the mother and seven fine children are seen on their way to Canada under the auspices of the Canadian National Railways. 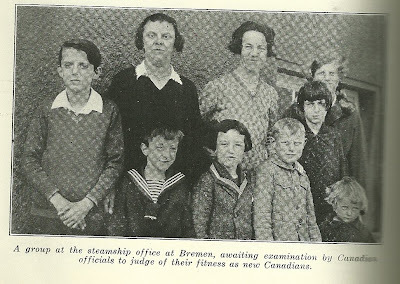 A group at the steamship office at Bremen, awaiting examination by Canadian officials to judge of their fitness as new Canadians. 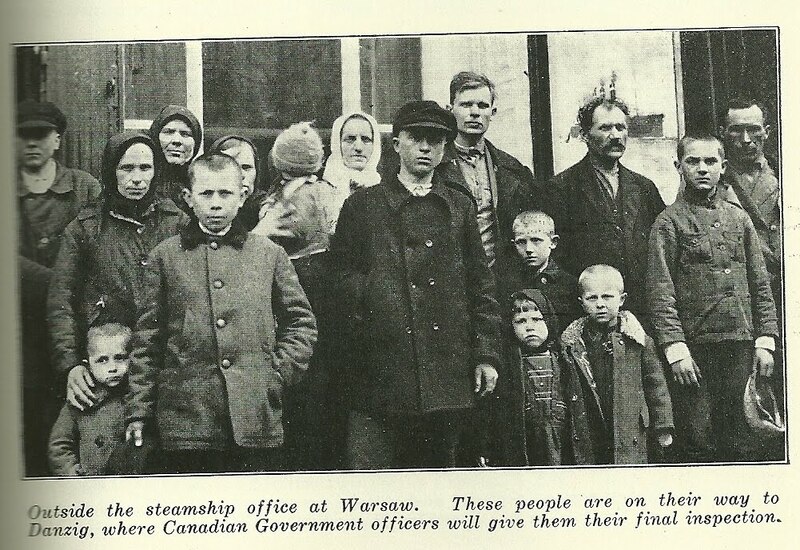 Outside the steamship office at Warsaw. These people are on their way to Danzig, where Canadian Government officers will give them their final inspection. A group of Finnish men and women on board a steamer leaving Gotenburg for Canada. Recognize anyone? If so, I hope you will contact me. Poem entitled "The Maiden of Quoddy, written by James De Mille, Maritime Canada author, poet and professor. 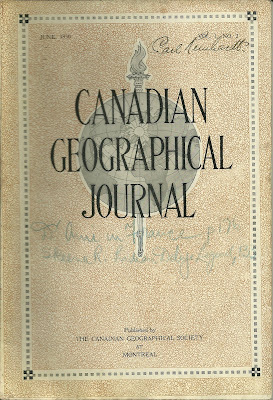 Found in the June 1930 issue of Canadian Geographical Journal, published by the Canadian Geographical Society at Montreal. The poem, containing many Passamaquoddy and other native words, will be a challenge to transcribe, but I'll give it a go. A friend recently co-authored a mammoth Passamaquoddy dictionary, and it will be interesting to compare the place names. Some online sources seem to feel that De Mille concocted the names of his two favorite rivers, but they seem plausible to me. Or the distant Saskatchewan rolls? Or perhaps in the Skoodoowabskook. That to either of these we will fly. Where it joins with the Skoodoowabskook. 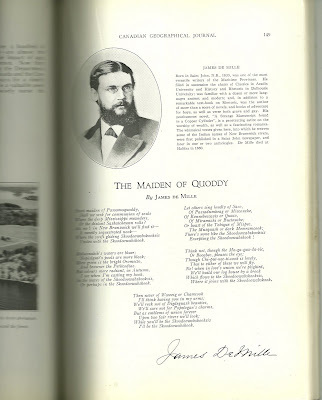 James De Mille (he changed the spelling from DeMill) was born 23 August 1833 in Saint John, New Brunswick, Canada, the son of Nathan S. and Elizabeth Tongue (Budd) DeMill. His paternal grandparents were John and Elizabeth (Smith) DeMill. John DeMill was a Loyalist from Connecticut who settled in New Brunswick, Canada. Elizabeth was also from a Connecticut Loyalist family. 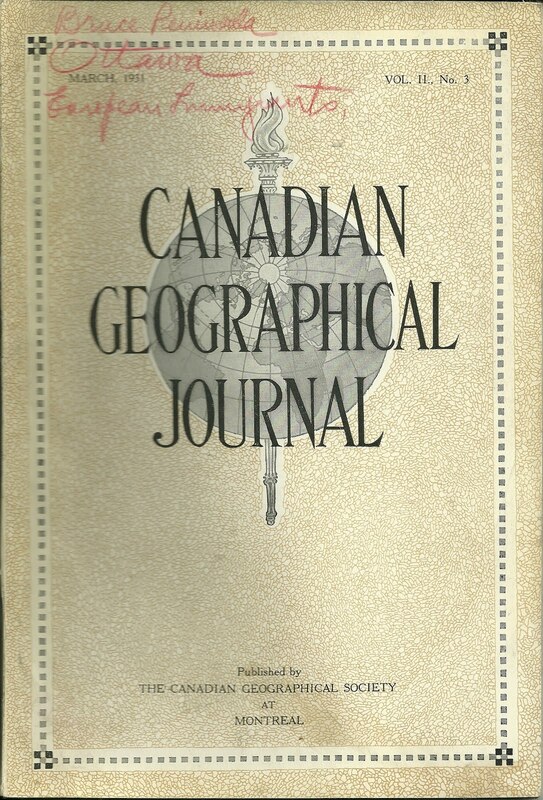 James De Mille's maternal grandparents were Elisha and Mary Ann (Bonnell) Budd. Elisha Budd was a Loyalist from New York, who settled in Nova Scotia. His father, James Budd, also a Loyalist, from White Plains, New York, was killed at his own door in 1778 by a party of Whigs who called themselves "The Cow Boys". Mary Ann Bonnell's father Isaac was a Loyalist from New Jersey who settled in Digby, Nova Scotia. James De Mille married Elizabeth Ann Pryor, daughter of Dr. John Pryor, first president of Acadia College. I don't know if they had any children or not. 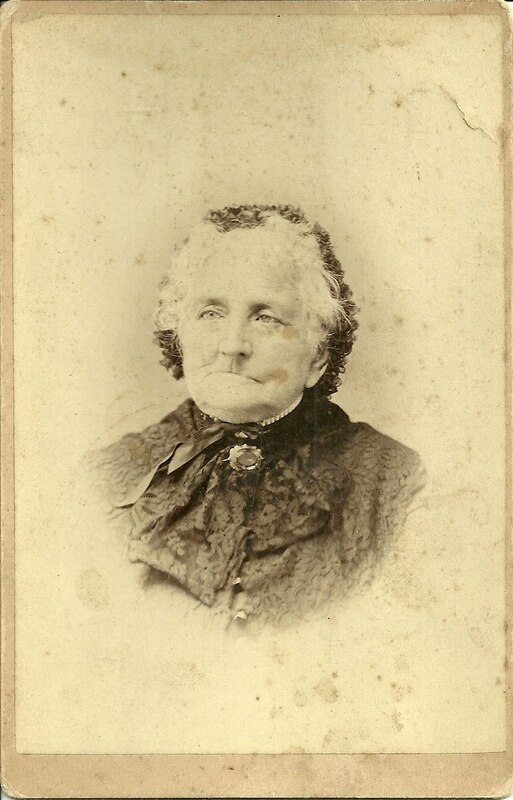 Wonderful cabinet photo of an elderly Ruth (Thorndike) McKellar, with an identification on reverse giving her residence as Spruce Head, Maine. Ruth Thorndike was born on 10 June 1796 in Thomaston, Maine, the daughter of Benjamin Thorndike and his wife Priscilla or Pat (Woodbury) Thorndike, who were both born in Cape Elizabeth, Maine, and moved up the coast to Thomaston. Please note in the comments section that a reader's research shows Ruth's mother's name was Priscilla, but he also notes that at least one other Priscilla in his family was nicknamed Pat. Ruth's paternal grandparents were Captain Ebenezer Thorndike, born in Beverly, Massachusetts, died in Thomaston, Maine, and his wife Lydia Herrick Thorndike, also born in Beverly and who also died in Thomaston. Ruth maternal grandparents were Charles Woodbury, born in Falmouth, Maine, and his wife Lucy Dyer, born in Cape Elizabeth. Ruth Thorndike married Thomas G. McKellar, who was born 15 July 1786 in St. George, Maine, the son of John McKellar and his wife Martha (McCarter) McKellar, who were both born in St. George and who both died at nearby Cushing, Maine. Thomas' paternal grandparents were Robert McKellar, born in Scotland - I have yet to disover his wife's name. Thomas' maternal grandparents were John McCarter of Cushing, Maine, and his wife Martha, born in Northern Ireland, died at Cushing. 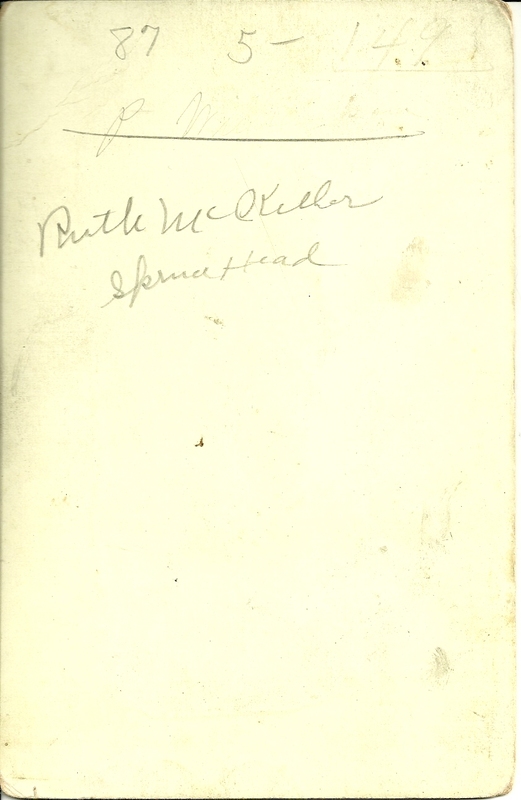 Thomas G. McKellar died 8 August 1848, but Ruth lived to the age of 94; she died 21 June 1890 in South Thomaston, Maine. Thomas and Ruth had quite a few children, but some of those children had short or fairly short lives. At least one son died at sea, and two died in far off places such as New Orleans or Havana, reflecting perhaps in all three cases the dangers of the seafaring life. Some of the daughters also died fairly young. Poor Ruth had quite a bit of sadness in her long life. At least she had some grandchildren to console her. Her daughter Hannah, who died fairly young, married Benjamin Fales and had two sons. Her son John also raised a family with wife Lucy or Lucille (Condon) McKellar. 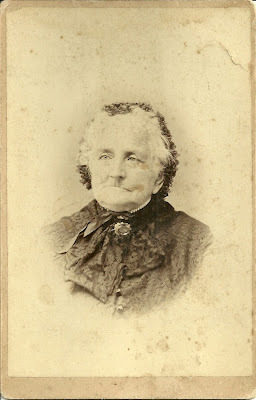 And possibly also providing Ruth with grandchildren was her son Joseph R., who was born about 1818, with his wife Elizabeth Ernst of Georgia, where Joseph settled. My hesitation about Joseph R. is that Ruth had a later son, also named Joseph, which is a bit confusing, since they both appeared to live into adulthood. Perhaps I've run into a mistake here. Perhaps the later Joseph had a different first name but went by Joseph. 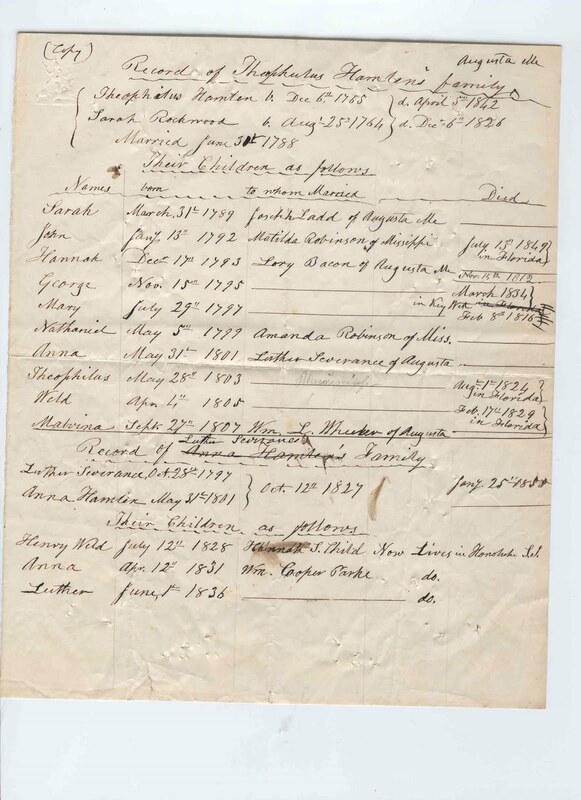 He was living with his mother on the farm in South Thomaston, along with his sister Priscilla and a sailor named Fred W. Fales, who was perhaps the son of Ruth's daughter Hannah (McKellar) Fales, who had died in 1857. Daughter Mary Emeline married Captain James Sayward Keller, who had changed his surname from Kelloch, and had a son James W. Keller, before dying in her 30s. If you have corrections to make to the information above or additions or comments, I would most appreciate hearing from you. Thanks for stopping by! 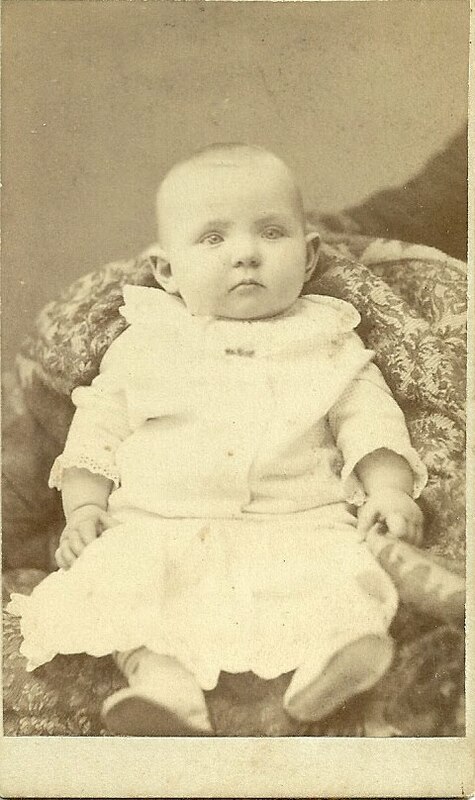 Carte de Visite of Ethel Waldron Orr, at age ten months; taken by A. O. Reed Studio in Brunswick, Maine. Ethel Waldron Orr was born 30 December 1882 on Bailey's Island, in Harpswell, Maine, the daughter of Captain James Lewis Orr and his wife Mary Louise (Stover) Orr. Her grandparents were Captain Sinnett Orr and wife Deborah (Merryman) Orr and Captain Lemuel Hinkley Stover and his wife Jane Johnson (Sinnett) Stover. Ethel Waldron Orr married Orrin Linwood Johnson on 17 September 1907. He was born 17 January 1876 in West Harpswell, Maine, the son of Sinnett Orr Johnson and Eliza Blake (Stover) Johnson. Orrin's grandparents were Captain Isaac Johnson and his wife Mary (Hodgdon) Johnson and Theophilus Stover and his wife Margaret Curtis (Blake) Stover. They had at least one child, a son. They lived in Harpswell, Maine, at least up until the 1930 Census, which is the last record available to me to see online. The surnames contained in the family tree of their son read like a who's who of the history of the Harpswell, Maine area: Orr, Johnson, Stover, Hodgdon, Blake, Merryman, Sinnett, with some of the surnames appearing multiple times. If you have corrections to make or insights to add, please leave a comment or contact me directly. Thanks for stopping by! 1922 postcard showing a house, presumably in Massachusetts, sent by its owner, Blanche, to Mrs. Ida Grant, New Sharon, Maine. 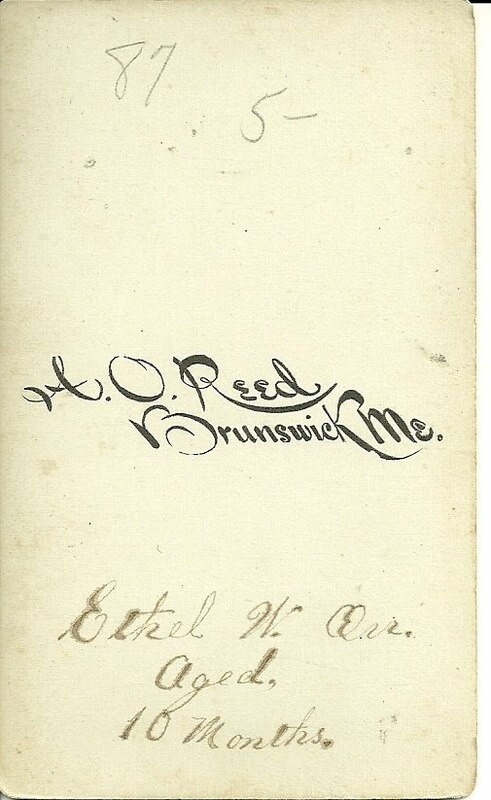 The postmark location is hard to read, but perhaps it's West Medford, Massachusetts - see below. Researching online, I found a Mrs. Ida Grant, married to Charles R. Grant, in the 1920 Census in Rome, Maine, which is close to New Sharon. Whether or not, I have the correct Mrs. Ida Grant, I'm not sure. If you feel I'm on the wrong track, I'd certainly appreciate hearing from you. 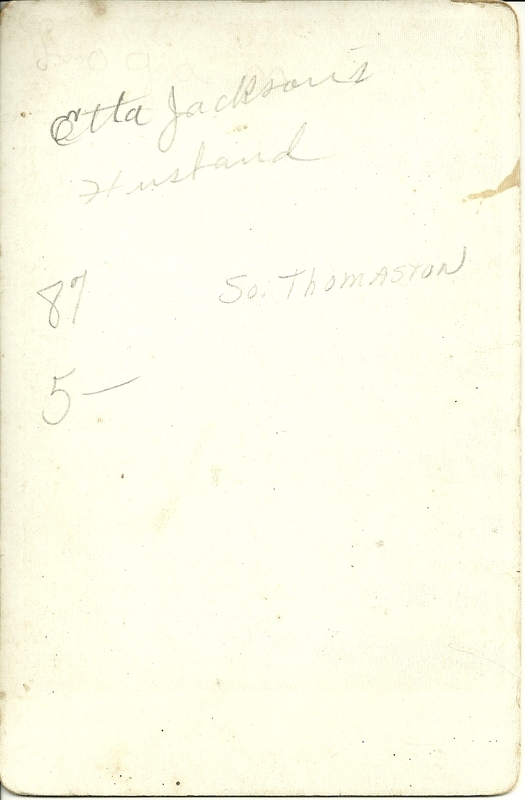 Ida E. Heselton of Augusta married Charles R. Grant of Augusta on 10 June 1893. They had at least five children that I've been able to find, using the Censuses. I haven't been able to learn Ida's parents as of yet, but I know she had a brother Frank, because he is living with them in 1920, after the death of his wife Ellen. What happened to their children, shown on earlier censuses, I don't know. Ida was born in Massachusetts in July of 1878 (though sometimes the year shown in the 1900 Census is off by a year). Frank was also born in Massachusetts, in November of 1865. I found a Frank R. Heselton born in Weston, Massachusetts on 25 December 1860, the son of Charles Clifford Heselton and his wife Lydia E. (Parsons) Heselton. Perhaps there is a relationship there, an uncle possibly or perhaps they're even the same person, with some errors online, meaning that Charles and Lydia could be Ida's grandparents or parents. As for Charles R. Grant, I haven't been able to learn his parents either, though not from a lack of possibilities. It's too common a name in Maine, I'm afraid. There's a tempting choice of Charles R. Grant in the 1880 Census, born about 1872, the son of Leonard R. and Lydia H. Grant. Lydia was married to an Austin before her marriage to Leonard R. Grant, as her son Edward H. Austin is living with the family. And then there's the question of who Blanche is - I was hoping when I started this process to find Ida's parents and, et voila, another daughter named Blanche. But I haven't been able to find Ida parents, so no luck in that regard. Blanche might have been a dear friend who moved from Maine to Massachusetts or she might have been a friend or relative from Massachusetts, bearing in mind that Ida was born in Massachusetts. 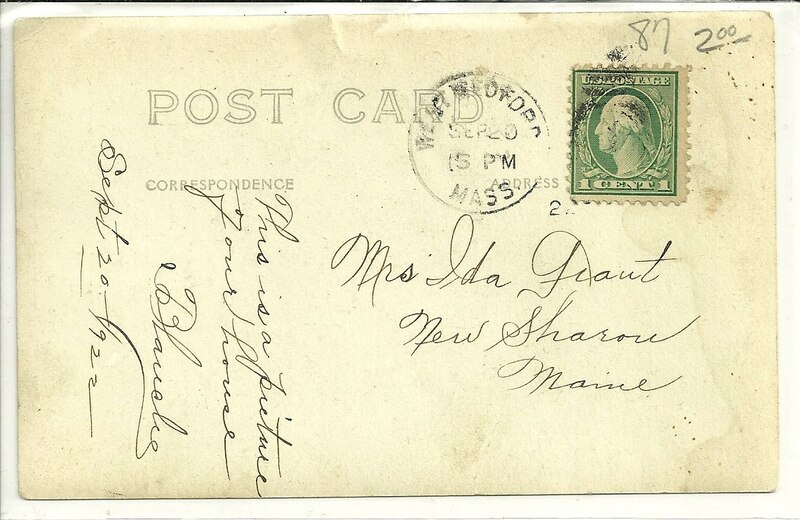 Remember, the Mrs. Ida Grant in the postcard might not be Ida Heselton who married Charles R. Grant. 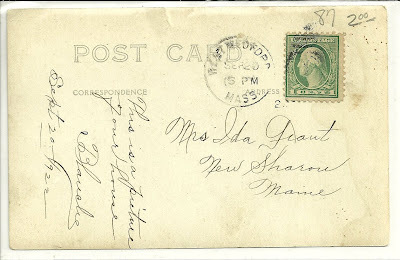 If you have any insights into the true identity of the Mrs. Ida Grant in New Sharon, Maine in 1922 or of the sender Blanche, I would very much appreciate hearing from you. If you feel I'm on the right track, please let me know that, too. Cabinet photo taken by the Chamberlain at the Vine Studio, Medfield, Massachusetts, of Mrs. Isabell Hall, Owls, Head, Maine. Researching online to ferret out the identify of Mrs. Isabell Hall, I found the 1870 Census for Rockland, Maine, with an Isabel Hall living with husband John F. Hall, a carriage maker. This Isabel was born in Maine about 1843. Whether she is the lady in the photograph, I have no idea, but Rockland is near Owls Head. 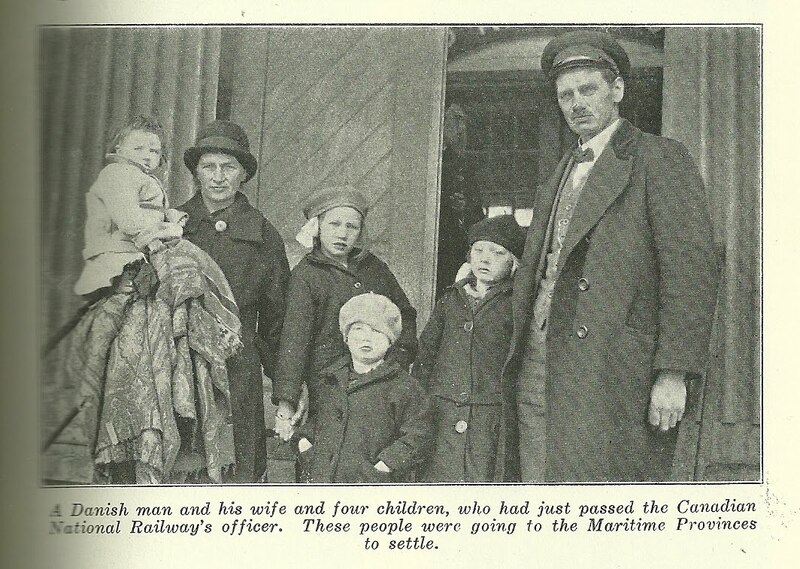 There was a 2 year old Benjamin living with them, possibly their child, and 18 year old Gilbert Hall, who worked in a carriage shop. 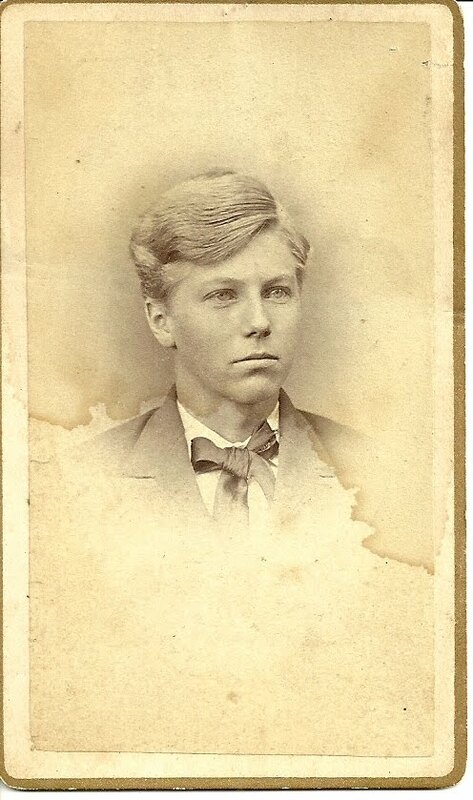 In other sources, I found that John Frederick and his wife Isabell had a son named Benjamin C. and that John Frederick Hall had a younger brother named Isaac Gilbert Hall, born about 1850. 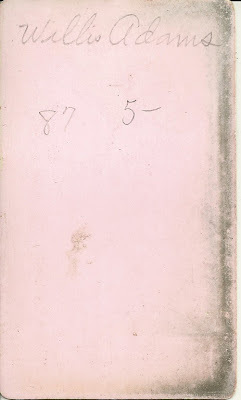 Assuming I have the correct Isabel/Isabell/Isabella - and hopefully someone will come to my rescue if I am wrong - Isabelle (Burton) Hall was born about 1843, possibly in Union, Maine, the daughter of Church Burton and possibly his wife Ann (Lewis?) Burton. Isabell's paternal grandparents were Benjamin and Lowly or Lola (Jameson) Burton. I'd like to know more about Isabell's mother Ann and her grandparents. 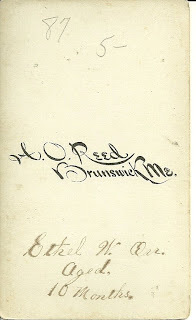 Isabell Burton married John Frederick Hall, or Frederick John Hall, as I also found his name, a carriage maker in Rockland. He was born 21 September 1840 in either Waldoboro or Rockland, Maine, the son of Isaac and Sarah (Hahn) Hall. His paternal grandparents were John and Olive (Tolman) Hall. I'd like to know more about his mother Sarah and her parents. Isabell had two children, Benjamin C. and Addie E., with her husband John Frederick Hall, before her untimely death in February of 1876. 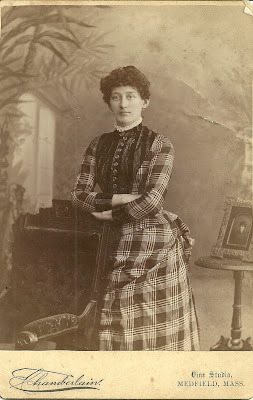 If this is the Isabell in the photograph, then the photograph would have to predate February 1876, and she would have had to make a trip to the Boston area at some point, for the photograph to be taken in Medfield, Massachusetts. Coastal travel between Rockland and Boston in those days was nothing out of the ordinary. John Frederick Hall went on to marry two more times. He and his second wife, Rosa Augusta Peterson had a son, Clarence F., born in 1881. Rosa Augusta also died an untimely death, in 1883, of typhoid pneumonia. John then married Mary C. Smith and had a daughter Edna Porter Hall in 1889. On 1 November 1897 in Rockland, John suffered a fatal injury in an accident. 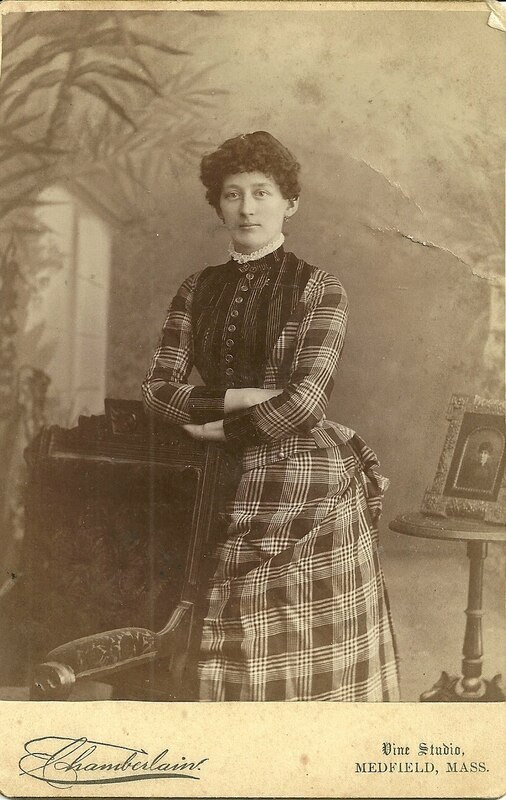 If you have any corrections, additions or insights regarding the information presented here, or if you feel that the woman pictured is another Isabell Hall entirely, please leave a comment or contact me directly. Thanks! For more information on Isabell Burton and John Frederick Hall, see their page at Maine and Maritime Canada Genealogy. 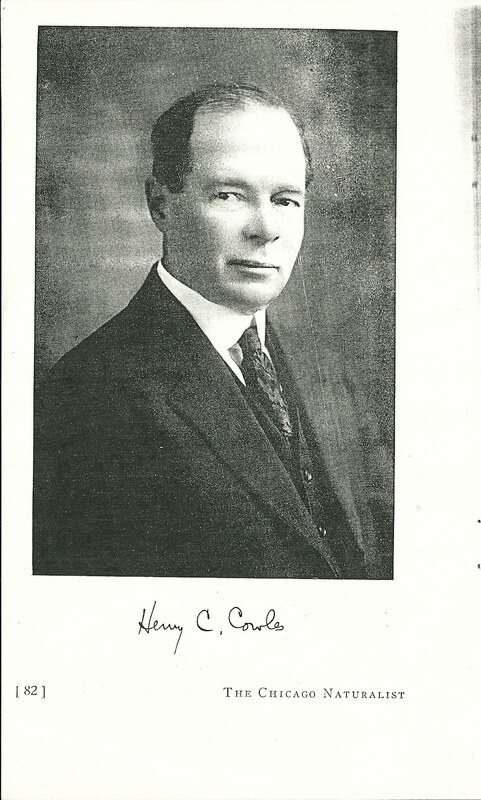 Dr. Henry Chandler Cowles, Emeritus Professor of Botany at the University of Chicago, died September 12, 1939. Dr. Cowles was associated with the Chicago Academy of Sciences for many years, having given lectures before its membership on many occasions beginning in 1899. Later he was elected to Life Membership and was a Vice-President from 1922 until 1934, when he was forced to resign because of ill health. In recognition of his many valued services, he was elected a Fellow of the Academy in 1934, shortly after his retirement from active work. He was a great teacher of botany and made important contributions to that science, and was active in may scientific organizations. 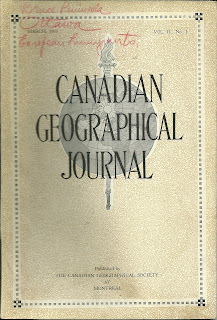 For many years he was a member of the Board of Directors of the Geographic Society of Chicago and its President from 1912 to 1914. During the years in which Dr. Cowles was President and Professor Cox Chairman of the Board of Scientific Governors, the Academy expanded its activities and added materially to its collections and increased its services to the public. In his quiet way, he accomplished a great deal, and his delightful personality and keen humor endeared him to all. We have greatly missed him since it became impossible for him to take an active part in our work and wish to express to Mrs. Cowles and her daughter our sincere sympathy. From online research, I found that Henry Chandler Cowles was born in Kensington, Connecticut on 27 February 1869, the son of Henry Martyn Cowles and his wife Eliza (Whittlesey) Cowles. He married Elizabeth Julia Waller in Louisville, Kentucky in 1900. She was born in Kentucky in 1880, the daughter of William Absalom and Mary Arabella (Senteny) Waller. Although most of the online sources I found gave Elizabeth Julia (Waller) Cowles' death year as 1929, I think it more likely that she outlived her husband, judging from the wording in the obituary. I found one site where her death was given as "aft 1929". It's possible that all the other sources fed off this one, except they dropped the all-important "aft". Then again, it's possible that she did die in 1929, as the online sources say, and Henry remarried a woman who already had a ["her"] daughter. But if that were the case, it seems as though the obituary would also have mentioned the daughter of Henry and Elizabeth, born in 1912, who outlived her father; she died in 2010. If you have any corrections, additions or insights regarding the information presented above, please leave a comment in the comment box or contact me directly. Carte de Visite identified as Willis Adams. Sadly, no photographer's imprint or handwritten locale. 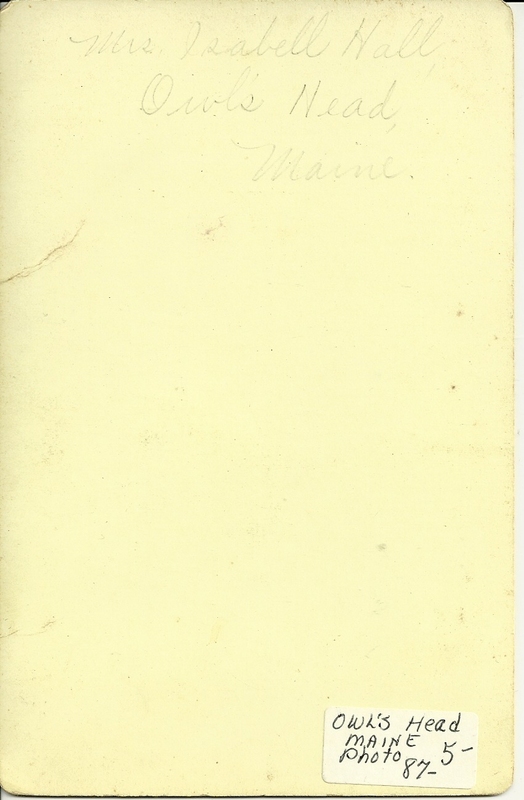 The card was purchased in Maine, which may be a clue or may be a red herring. Since this CDV was found with some photographs of the Thomaston and Owls Head areas of Maine, it's possible that the young man pictured is Willis Adams, who was born in Maine in 1855 and lived in Dixmont and South Thomaston, Maine, until sometime before the 1920 Census when he was enumerated in Melrose, Massachusetts, and later in DeKalb, Georgia, in the 1930 Census. In the 1900 Census, a man by the name of John Q. Adams is listed as the father of Willis. With this clue, I was able to find a John Q. Adams in Dixmont, Maine, in the 1870 Census, living with wife Abbie L. and children, including a Willis, whose age fits. I don't know if Abbie L. was actually the mother of Willis. In the 1880 Census, Willis, as yet unmarried, was living in South Thomaston, Maine, and gave his occupation as teacher. In 1900, according to the Census, he was living in South Thomaston with his family and working as superintendent [I think - the writing is struck over] of a granite quarry in Spruce Head. In the 1910 Census, he and his family were still living in South Thomaston, and he was still at the granite quarry. Then, as mentioned above, Willis, his wife Mary and daughter Helen moved sometime between 1910 an 1920 to Melrose, Massachusetts, where Willis gave his occupation as poultry farmer. By the 1930 Census, Willis, Mary and Helen had moved to deKalb, Georgia to be with son Brainerd Lucas Adams and his family; Willis gave his occupation as farmer. As yet, I haven't determined the maiden name or parents of Willis' wife Mary. From Census information, I determined that they had at least two daughters and son, Brainerd Lucas Adams, mentioned above. I found references online that Brainerd received his education at Bowdoin College in Brunswick, Maine. In the 1930 Census of DeKalb, Georgia, his occupation is given as insurance. Daughter Helen was working as a bookkeeper in 1910 and at a hospital in 1920; in 1930 no occupation is given for her. I lost track of daughter Marguerite after the 1910 Census. Hopefully, someone familiar with other photos of Willis Adams of Dixmont and South Thomaston, Maine, will contact me, yea or nay - hopefully yea - and provide additional information on the Adams family of Midcoast Maine. Cabinet photograph of John Roberts Edwards, born in Minersville, Pennsylvania on 19 Nov. 1848, the son of John and Margaret (Roberts) Edwards, who found their way from Wales in Great Britain to Pennsylvania, and, sometime before 1869, to Utah. The photograph was made by the studio of Thomas S. Odell of Logan, Utah. John Roberts Edwards married Marion Eliza Sermon in Logan, Utah, in 1869. They had at least two children, before Marion died in 1889. On 16 November 1890, John Roberts Edwards married Barbara Etta Jackson, who was born 20 Dec 1860 in South Thomaston, Maine, the daughter of Alexander Samuel and Flora Ann (McDonald) Jackson. I found a source online that described Barbara Etta Jackson as a teacher. As you can see, John Roberts Edwards is not identified per se on the cabinet card. Rather, it was his relationship to Barbara Etta Jackson that allowed his identification to be made, though it took me some time to sort it all out. 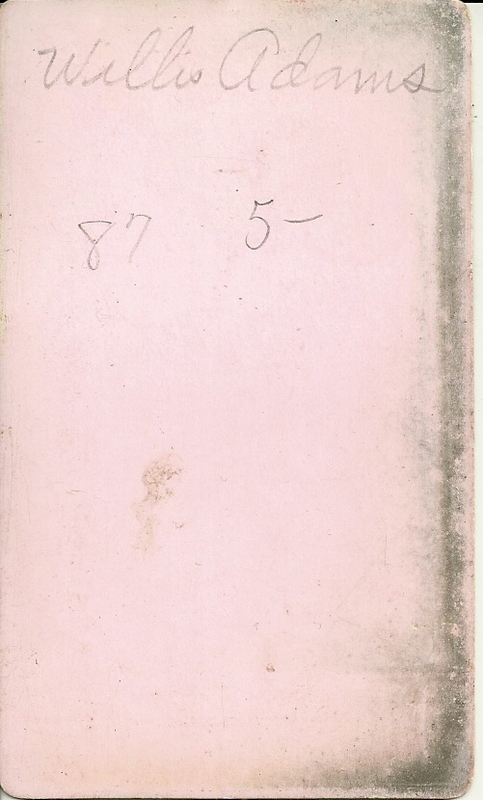 I'm guessing that this photograph was sent by Etta (Jackson) Edwards back home to a friend or relative, as it was purchased in Maine. I'm always intrigued by how married people first met, and this case is no exception. I noticed that Barbara Etta had brothers who, according to the Census, spent time in Montana; perhaps she followed them west sometime after the 1880 Census, at which time she was enumerated living in South Thomaston with her parents. By 1900, she is living with her husband, John Roberts Edwards, in Logan, Utah, where he is a saloon keeper. By the 1910 Census, they had moved to Fresno, California, where John Roberts Edwards listed himself as a farmer. John Roberts Edwards and his wife Barbara Etta (Jackson) Edwards) had several children, three of whom appear to have died young, and three who lived to adulthood. There may be children that I missed. If you have corrections, additions or insights regarding the information presented above, please leave a comment in the comments box or contact me directly. 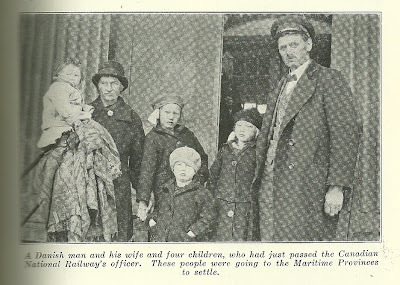 Sad article in the December 12, 1911 issue of Christian Leader and The Way. Wichita, Kan. Dec 5 - I have just learned, through Bros. M. A. McPeak and Wilson Baird, elders of the church at Meridian, Okla., that Bro. George Dancy, also one of the elders, has lost his house and contents by fire. The little congregation at Meridian will share in this loss, and are not appealing for aid. But I know their ability as well as I know their willingness, and with their burdens and obligations they are not equal to this demand. I believe there are congregations and brethren that will aid our brother, when informed of his loss. That is why I write this. Bro. and Sister Dancy are in the decline of life, and this is their second loss of this character within the past two years. They are faithful in the Lord and altogether worthy. Send to elders of the Church of Christ, Meridian, Oklahoma. I found a George Dancy in the 1920 Census in Oklahoma; he was born in North Carolina about 1865 and was married to Laura. Too young to be "in the decline of life" in 1911, I'd say. In the 1930 Census, I found a George Dancy born in 1851 in Missouri and living with his son and wife, William and Clara Black in Cross, Oklahoma; possibly he was Clara's father, rather than William's. He was apparently widowed by that point. This George Dancy would have been about 60 in 1911, so perhaps "in the decline of life" [though it pains me to say so]. Whether either of these is the George Dancy referenced in the article, I have no idea. Perhaps a reader can clear up the mystery. Interesting article in the magazine The Young Idea, a Magazine of Character Study, Questions of the Hour, Field Work in Botany, Birds and Insects, published by Allen Company at Melrose, Massachusetts, May 1911. AT FREDERICTON, N. B. CANADA. This school was established for the purpose of affording teachers and the opportunity of combining the study of some specialty with the rest and recreation of a delightful and inexpensive outing. Work and recreation are combined in a most attractive way; the mornings are given to lectures, the afternoons to field work and laboratory work, and the evenings to lectures and discussions, to which the public are invited. In the laboratory the field work of the School improved methods of teaching are exemplified by the very best teachers. The excursions, public lectures, etc., give the teachers a rare opportunity of becoming acquainted with the resources of the Maritime Provinces, as well as with some of the most prominent men and women. The delightful and sympathetic companionship of congenial minds and the large amount of outdoor exercise in collecting plants, insects, minerals, shells, etc., combine to make attendance at the Summer School the most recreative of holiday trips, while it is at the same time one of the least expensive. It increases the usefulness of teachers by enabling them to direct attentive to those scientific subjects which to a large extent lie at the foundation of the material prosperity of the Atlantic Provinces of Canada. There are three classes of subjects taught - Physical sciences, embracing physics, chemistry, geology and mineralogy; biological sciences, including botany, zoology, physiology and entomology; miscellaneous, including literature, agriculture, drawing and manual training. Additional courses will be provided in music, elocution, French, German, psychology and child study. Registration, which entitles students to attend all except advanced classes, $2.50. Board in private families can be procured for from $4.00 to $5.00 a week, and in hotels for from $5.00 to $6.00 a week. All applications for board must be sent to the Local Secretary, Mr. T. B. Kidner, Fredericton, N.B., not later than June 15th. Reduced rates of travel will be arranged for on all railroad and steamship lines. All must be careful to procure a "Standard Certificate" from the ticket agent when purchasing their tickets. These certificates, when countersigned by the Secretary of the school, entitle the holders to free or reduced return fares. Further information regarding travelling arrangements will be published in the press from time to time. "Duly licensed teachers, who shall have taken the course prescribed for School Gardening during two years at the Summer School of Science for the Maritime Provinces, and who shall have obtained a certificate of competency therefrom, shall be eligible to receive the grant allowed for School Gardening. The course of study in this subject given by the Summer School of Science is to be approved by the Board of Education." The course in Manual Training will consist chiefly of the various forms of educational handwork suitable for small schools; for the lower and middle grades of town and city schools. Particular attention will be paid to work which can be carried on in the ordinary classroom, with very little apparatus or equipment. Paper folding, free cutting and elementary pattern design in colored papers. Constructive work in heavy paper, fancy and plain cardboard, etc. Elementary bookbinding and portfolio construction. Cardboard modelling, involving the study, development and construction of the type solids used in the teaching of drawing. A pair of scissors, H H pencil, ruler, compass and pair of triangles. The rest will be provided by the school. 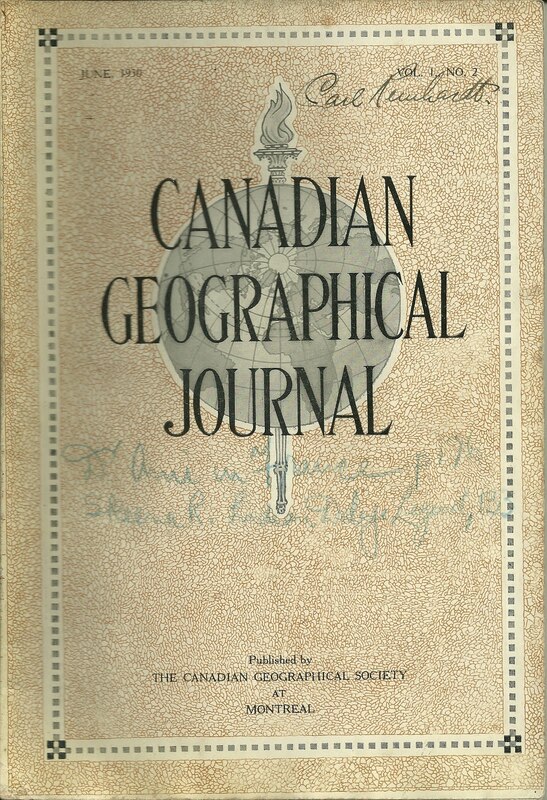 I found a reference online where this summer school program was organized by Alexander H. MacKay, who was described as one of Canada's "foremost Educationists and Scientists". Halifax or points in between. If only those days could return! Obituary of Vernon Blaine of Huntsville, Kentucky, in the December 12, 1911 edition of the Christian Leader and the Way newspaper, published in Cincinnati, Ohio, by F. L. Rowe, edited by Joseph E. Cain, James A. Harding, and Ira C. Moore, with Associate Editor Jesse P. Sewell. 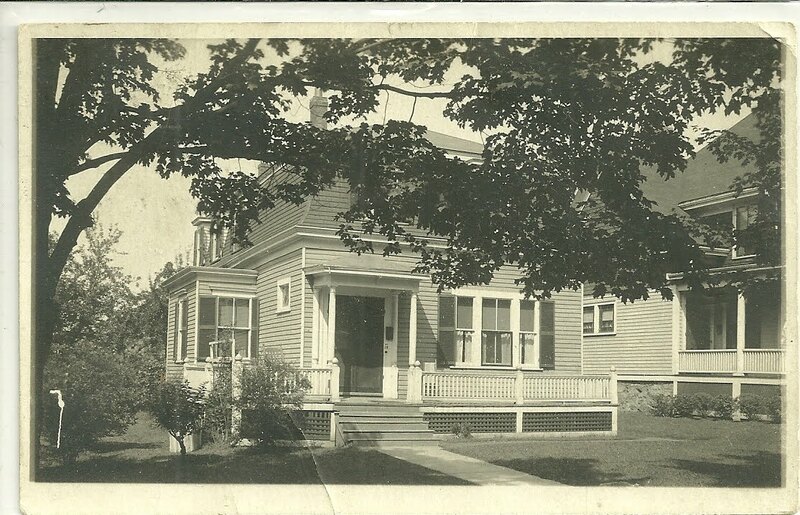 BLAINE - On Monday, Nov. 6, 1911, death visited the home of Bro. and Sister James A. Blaine, at Huntsville, Ky., and took away the spirit of their little son, Vernon. He was born June 10, 1909, and died Nov. 6, 1911. His life on earth was short, but was long enough for him to become precious to his father and mother. It was hard to give him up, but we should submit to his will, "for he doeth all things well". Bro. and Sister Blaine should feel that heaven is nearer to them and should strive to meet their little one on the other shore, where there are no more tears or separations. May the bereaved ones ever look unto Jesus for comfort and trust him for a happy reunion in the New Jerusalem. Researching online, I found a James Alexander Blaine of Huntsville, Kentucky, who married Bonnie Emma Oates on 28 February 1907. However, It's very possible these are not the right parents for Vernon, as they had a son named James Alexander Blaine, Jr., born in June of 1909, and there's no reference to a twin in this obituary, though admittedly it's more of a religious obituary than a genealogical one. Also, Vernon isn't mentioned in their household in the 1910 Census, even though he would have been alive then. But I haven't yet found another James A. Blaine in the Huntsville, Kentucky area. Hopefully a reader will recognize Vernon Blaine and his family and will contact me with the proper identification. I'd also like to know more about the John H. Hines who submitted the obituary to the newspaper. I found a possible Census reference but the scan was so light I couldn't read the entries. Obituary for Hattie Tucker, in the December 12, 1911 edition of the Christian Leader and the Way newspaper, published in Cincinnati, Ohio, by F. L. Rowe, edited by Joseph E. Cain, James A. Harding, and Ira C. Moore, with Associate Editor Jesse P. Sewell. TUCKER - Hattie, the beloved wife of Bro. Albert Tucker, was born May 17, 1882, in Kanawha County, W. Va., and departed this life August 27, 1911. Sister Tucker leaves a father, mother, three brothers and two sisters, husband and three children to mourn their loss, and while we sympathize with the bereaved ones, we believe that our loss is her gain. Sister Tucker has been a member of the church for eleven years, and was a member of the congregation at Hugheston, W. Va., at the time of her death, and the last words to husband and the three little ones were "Meet mamma in heaven". Funeral services were conducted by the writer at the home at 3:30 p.m., on the 28th, after which the remains were laid to rest in the Wyatt Cemetery. Researching online, I found that Albert Norman Tucker was born 14 April 1876 in West Virginia, the son of James Phelps Tucker and his wife Alice J. (Huddleston) Tucker. I was less successful finding out the parents and maiden name of Albert's wife Hattie, though several online references put her surname as Dorman. The birth year given as 1882 in the obituary does not agree with most online sources, which place it at 1883. Disturbingly, those same sources give her date of death as 1921, which perhaps started off a a typographical error and was then copied by subsequent researchers. The newspaper has a clear date of publication of December 12, 1911, and the person who submitted the obituary indicated that he was the person who conducted the funeral service, so 1911 seems the logical year of death, though the obituary may be wrong on the month and day. In the 1910 Census, I found Albert and Hattie Tucker living with two children and Albert's brother-in-law, listed as Ernie L. Dorman, possibly Hattie's brother and possibly giving a clue to Hattie's maiden name. I found some references to him, including the possibility that he was the William E. Dorman, who was living with parents John W. and Bettie A., in Cabin Creek, West Virginia, also in Kanawha County. So it's possible that Hattie's parents were also John W. and Bettie A. Dorman. What's worrying me, though, is that this Ernest did not go by William E. Dorman on his WWI draft registration card - but rather by Earnest Dorman. Rev. E. K. Smith, the only colored delegate, thought secret societies were wrong because they compelled a man to keep secrets from his wife, which was contrary to the Bible teachings. Hopefully, readers will come to the rescue to clear up the mystery of Hattie's maiden name and parents and to give the complete name of Rev. E. K. Smith.